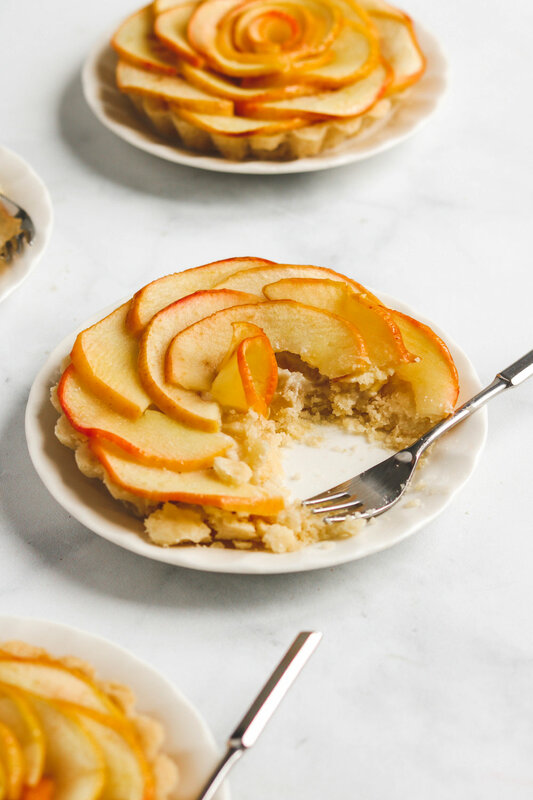 These Vegan Apple Rose Tartlets are paired with a hidden layer of almond paste and encased in a crisp flakey crust. Not only does it taste wonderfully delicious, but it’s beautiful too! Vegan & made with just 5 ingredients. I know, I know it’s not February yet but I couldn’t wait to share these Vegan Apple Rose Tartlets! I absolutely love the combination of juicy sweet apples and the nutty flavour of almonds, especially in baked goods like tarts. They look complicated, but I promise- they’re quite easy to make! Hint hint, valentine’s day is coming up and I think these would be perfect to bring out for dessert! 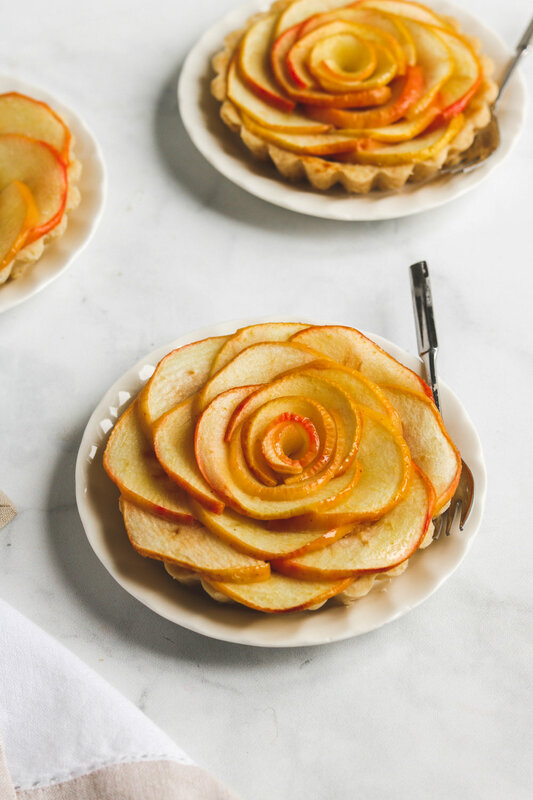 Whether you’re spending it with your partner, with your friends or even by yourself, these pretty lil’ Apple Rose Tarts will for sure fill your heart. Let’s get into it, shall we? All we need is 5 ingredients: a prebaked tart base, apples, sugar, almond meal and aqua faba. The pie/tart crust should be blind baked, for around 15 minutes. 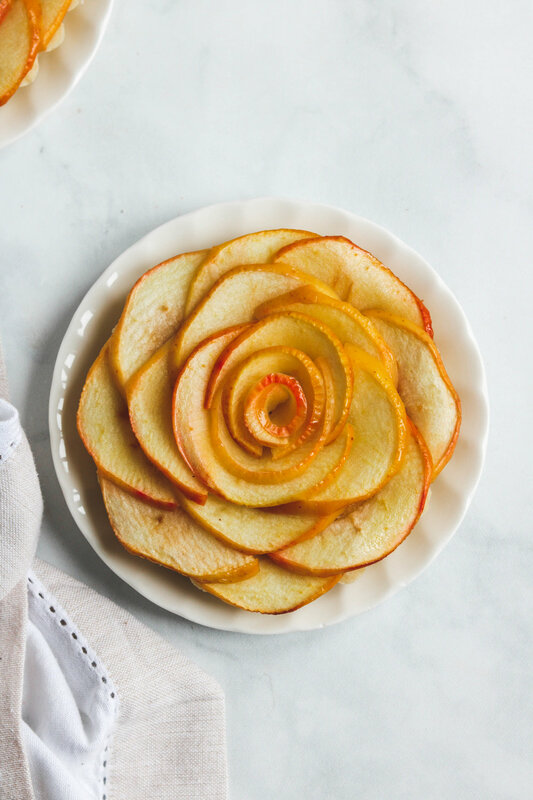 Simply spread the almond paste on the bottom and then start layering the apple rose petals! If the apple slices don’t curve around the tart, they were either cut too thick or not softened enough. and would make a beautiful edible gift for any occasion! When creating the rose shape, I like to start on the outside and work my way in. You can watch this video to see how I did it! If you recreate these Vegan Apple Rose Tartlets please share it and let me know what you think by tagging me on Instagram @lisakitahara, I love seeing all of your tasty recreations!